This is the story from the period of the Ramayana. 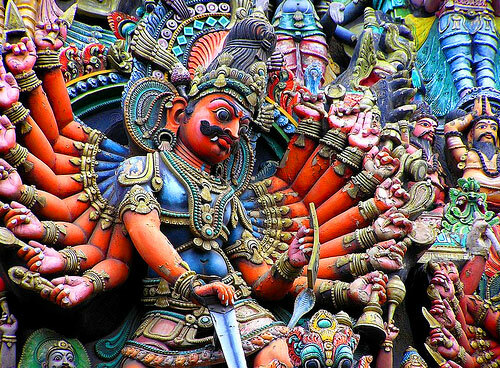 Ravana has obtained a boon from Lord Shiva that he shall not be slain by the Devas, the divine beings, Gandharvas, the Yakshas or by the Rakshasas. He did not include human beings into the list. Lord Vishnu took birth as a human in the form of Rama, and thus Ravana could be killed. Jayadrath was brother in law of Kauravas. He had a boon from Lord Shiva that he can stop all Pandavas for a day in a battle except Arjuna. 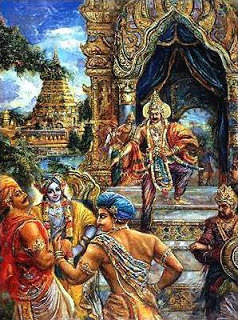 He did so on thirteenth day of the Mahabharata war and did not allow pandavas to come into the chakravyuha. Arjuna’s son knew to enter the chakravyuha and he was trapped there as Pandavas could not follow him. Abhimanyu died a glorious death while defending Yudhishthira. Arjuna vowed that the next day, he will kill Jayadrath or set himself on fire. The next day, Shri Krishna has to resort to his exploits when he made the sun to disappear using his Sudarshan chakra. Seeing this, Jayadratha came out of hiding to celebrate Arjuna’s defeat. At this point of time, Shri Krishna withdrew the chakra and told Arjuna – Here is the Sun and here is Jayadrath, so kill him. Arjuna duly obliged and thus Jayadrath was killed in the Mahabharata war. Here is another story, Jayadrath was granted a boon by his father, sage Vridhakshtra that whosoever causes Jayadrath’s head to fall, his head will be burst in 100 pieces. Shri Krishna directed Arjuna to cut his head in such a way that it falls in the lap of his father. You know what could have happened next? Lord Vishnu took the form of Narasingh avatar and killed him in a place and at a time which fulfilled above prophecy. Bhagwan Narsingh’s head was of a lion and his body was of a human being (He was not the creature created by Lord Brahma). He immediately attacked Hiranyakashyap and fought with him. He fought till it was evening (neither day nor night). At that time he picked him up, took him to the door (neither inside the house nor outside the house), kept his body on his lap (neither on Prithvi nor in the sky) and ripped his stomach with his nails (not with any kind of weapon). Bhasmasur obtained a boon from Shiva that any person who is touched by Bhasmasur on his head, will burn into ashes immediately. After obtaining this, he tried to test this on Shiva. Shiva had to flee and he sought Bhagwan Vishnu’s help in this. He soon appeared before him in a form of beautiful lady, Mohini. 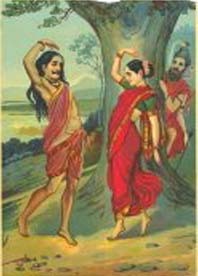 Mohini asked Bhasmasur to match him while dancing and she will marry him. During the competition, she put a hand on her head, Bhasmasur obliged and immediately turned into Ashes. Pandu had a curse from Sage Kindam. Kindam died when he was spending time with his wife in the guise of deer. Pandu was hunting and he accidentally killed the couple. They cursed him that he will die similarly. Later, a day in forest, Pandu was with his wife Madri and forgot about the curse. Soon, both of them died as a result of the curse. This story is from the days of Mahabharat. This story is from Mahabharat period. Jarasandh was killed in the same way he was born, in two pieces. Mighty Bhima, one of the Pandavas, fought a one to one battle with him and torn him in two pieces and threw them in opposite directions. Jarasandh was born in two halves after his father distributed the divine fruit to two of his wives. He was immensely powerful and was planning to become immortal when Krishna intervened. The fight between Bhima and Jarasandh reached and end only after Shri Krishna advised Bhima to throw the two halves of Jarasandh in opposite directions. Shri Krishna, the central character of Mahabharat, has been instrumental in many such incidents. In the period of the ramayana, bali and sugriva were two brothers. Bali has the boon that he will get the half strength of his opponent in any battle. Thus it was impossible to beat him by fighting with him. 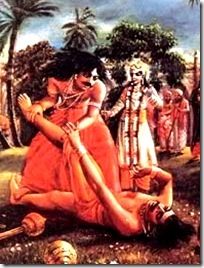 Bali has also done injustice to his brother Sugriva. Ram, decided to help him and asked Sugriva to fight with his brother with a garland. 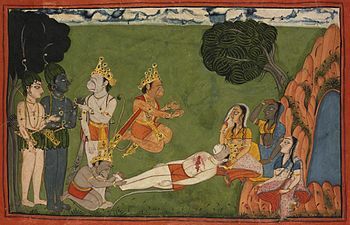 Thus Rama identified Sugriva and killed Bali with an arrow from hiding. 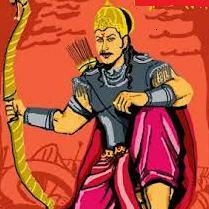 Sugriva, later helped Rama when he searched his wife, Sita and his vaanar sena helped in fighting the war with Ravana.